For those of you who have been following me for a long time, then you know that I’ve long been a proponent of performing horizontal (anteroposterior) based hip extension exercises to complement vertical (axial) based hip extension exercises. See my Load Vector Training (LVT) post if you’re not familiar with the concept (also see my eBook from 4 years ago which heavily addressed the topic). 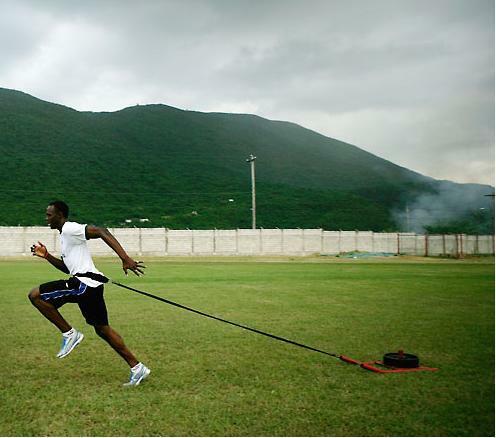 Usain performing pendulum quadruped hip extensions – these can be done underneath a reverse hyper too. Essentially, the theory is that axial hip extension exercises strengthen hip extension power in flexed-ranges due to their torque-angle curves, whereas anteroposterior hip extension exercises strengthen hip extension power in extended-ranges due to their torque-angle curves. See Are All Hip Extension Exercises Created Equal if you have access to the Strength & Conditioning Journal. You can also just think of it like this: squats and good mornings are hardest down low when the hips are bent but easy at the top ROM when the hips are straightened, whereas hip thrusts and back extensions are easier at the bottom ROM but hardest up top when the hips are straightened. Both ranges; flexed and extended, are needed for optimal sprinting performance, especially considering that the ground contact phase is characterized by more neutral hip ranges of motion (however there are reasons why axial exercises are critical too which is beyond the scope of this short article). 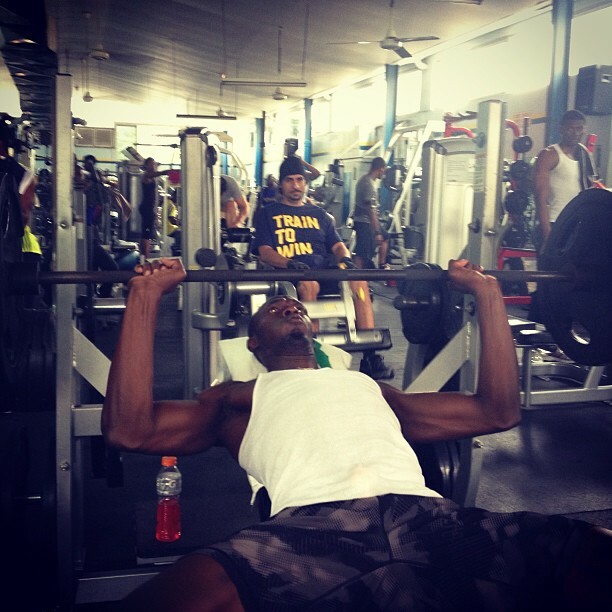 Going back to Usain’s Instagram – he’s posted two pictures and two videos of him training in the gym. The two pictures are of him performing barbell incline press and alternating dumbbell curls. The two video clips are of him performing an abdominal circuit and a lower body circuit. The abdominal circuit consists of seated medball Russian twists, supine alternating knee raises, v-ups, supine knee raises, alternating active straight leg raises, and modified medball v-ups. The lower body circuit consists of pendulum quadruped hip extensions, hang cleans, leg extensions, calf raises, and standing cable hip flexion. *UPDATE AS OF 11/30/14, here are some more recent clips: another abdominal circuit video clip, a core circuit clip, a pic of sled work, a pic in between sets of hang cleans, a pic showing Usain hooked up to a crazy electrical muscle stimulation suit, and a video clip showing ankle weight step ups into hip flexion. Earlier in my strength coaching career, when I wasn’t as knowledgeable and well-versed in sports science, I’d have scoffed at his workouts. I’m sure that the vast majority of strength coaches who read my blog will scoff at his workouts just as I would have several years back. This is unfortunate, as the S&C industry is so quick to make hasty generalizations and be judgmental regarding programs that don’t line up with their vision of what a perfect program entails. I can’t comment on Usain’s entire training program – in order to do that I’d need to see what his coach has him doing for an entire four year period. Keep in mind that he needs to peak for the next Olympics in Rio in 2016. Therefore, I’d need to see everything that Usain does, from sprinting, to weights, to plyos, to sledwork, to nutrition, to supplementation, to stress levels, to sleep. I’d also need to know his entire history of training and how it progressed over the years. From the 21-25 minute mark below you can see Usain doing some hip and t-spine mobility work, glute activation work, machine squats, pendulum quadruped hip extension, calf raises, walking db lunges, core work such as superman rotations, and sled work (Mills says that he does three sessions per week lasting around 90 minutes). The first thing that came to mind was that I liked seeing Usain work his glutes at end-range hip extension on the quadruped machine. It looks like he has some strong glutes at this range which surely helps propel him forward when sprinting . Chris and I reviewed a study in our special Sprinting eBook that showed that Usain exhibits longer ground contact times, lower stiffness (more compliance), smaller stride rates, and similar vertical forces compared to Tyson Gay and Asafa Powell. 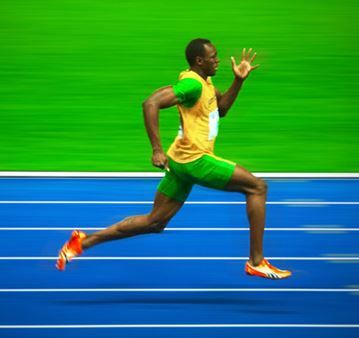 Usain’s sprinting superiority comes from his much greater stride lengths. Stride length rises by increasing ground reaction forces. But you want the force to be directed appropriately – when individuals direct their force production with more forwards orientation, they sprint faster. Horizontal ground reaction force production comes mostly from the hip extensors and knee flexors, according to a brand new study HERE. This information jives with other findings that Chris and I covered in our sprinting product. My guess is that what makes Usain so great at sprinting is his superior horizontal force, horizontal power, and direction of force application technique, which are attributable to his anthropometry, glute and hamstring leverages, and superior fiber type percentages. It also helps that he’s from Jamaica, where sprinting is prioritized! Getting back to Usain’s training – he uses very good form on the pendulum quadruped hip extension and doesn’t hyperextend his lumbar spine. This is even more impressive considering the marked anterior pelvic tilt that he exhibits. I also liked seeing Usain perform some cable hip flexion and other exercises to work his hip flexors. There exists some good research to support training hip flexion for speed gains. Moreover, I like seeing hip flexion being trained in a manner that resembles sprinting posture. I read that Usain’s favorite exercise is the hang clean and that he despises squatting. It’s important for an athlete to feel comfortable with an exercise and not be worried about injury potential. The majority of my colleagues would scoff at Usain’s hang clean technique. 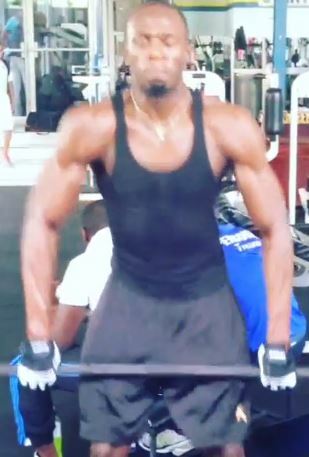 The internet loves to bring out the form police (kettlebell people are the worst in this regard, but Olympic and power lifters are guilty of this too), but I can tell you that Usain is still using his hip extensors explosively to catapult the barbell upward. Sure he’s using a lot of upper body English and getting increased arm, shoulder, and back effort, but his hips still receive an explosive training effect, even with the shorter ROM. Moreover, it appears that he sticks with 135 pounds when he performs these and doesn’t try to increase the weight over time. So even though he might catch the load with a slightly hyperextended lumbar spine and the elbows pinned down, it’s not likely to cause problems. The point is that Usain has found a power exercise that he enjoys and can perform consistently over the years. 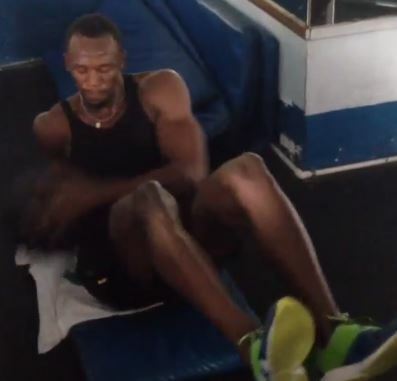 I liked that Usain trains his whole body – abs/core, lower body, and upper body. The body is a unit – a kinetic chain of links that work together to maximize speed. While certain links are more important than others (glutes and hammies), all of the body’s muscles must be powerful and coordinated for optimal performance. A strong core can help protect Usain’s spine by transferring forces more efficiently and sparing the lumbopelvic structures. I once heard Usain’s coach Glen Mills mention that he felt that weights and sled work aided Usain’s development as a sprinter tremendously over the years by increasing leg mass and leg strength. Usain has mentioned that he doesn’t like weight training that much and that he isn’t gym strong. Many high-caliber athletes feel this way, and I believe that they intuitively understand that their bodies are unique and that too much resistance training can hamper their performance. Athletes like this gravitate toward lower volume training and are protective over their strength reserves. I haven’t seen Usain train in person. I read that he performs machine squats, so I’m not even sure if he performs barbell squats, RDLs, or full range Olympic lifts. What I will tell you is that based on these videos, Usain is sparing his CNS for the most important activity for speed development – SPRINTING! Most strength coaches, upon acquiring a world-class sprinter, would screw him up by imparting their strenuous programs upon the athlete. Usain has the fast-twitch muscle fibers. He has ideal body length proportions. He has the rapidly firing nervous system. He’s spent years developing sprint qualities and honing his technique. The last thing you want to do as an S&C professional is screw things up by radically altering his programming. Training him to be the strongest lifter he could possibly be would detract from his sprinting performance. Don’t get me wrong, I’m all for intense lifting for athletes. But if you had Usain training like Stan (see video below), grinding out heavy loads week in and week out, his sprinting speed would diminish. Strength training should complement sprint training, not interfere with it. I saved the most important consideration for last. You want to know how Usain will remain at the top? By remaining healthy! If he stays injury-free, he can continue to maintain his performance (or even make small improvements for that matter). But if he herniates a disc by rounding the low back while pulling too heavy of deadlifts, develops patellofemoral pain from heavy squatting with knee valgus, or irritates his SI joint from performing back extensions with too much low back arch, then the weight training would severely hamper his performance. Furthermore, if he fries his CNS by overemphasizing heavy strength training for months on end, then he’d likely end up hurting himself as a result of a fatigue related injury – perhaps a hamstring pull on the track. The exercises that Usain employ are not very risky. They don’t lead to high levels of joint stress or muscle damage, they’re performed with higher repetition ranges, and Usain seems to be enjoying himself. This is important because Usain should have a positive outlook on weight training and be committed to his training. Again, I’m not aware of how Usain trains year-round, and all I can go by is the limited information I’ve found on the web. So take that for what it’s worth. However, based on what I see, I feel that Usain does a great job of providing a general hypertrophy and strengthening stimulus to the muscles that are important for sprinting, while allowing him to devote the majority of his attention to sprinting. I also feel that this training helps keep him healthy and is complementary to his track efforts, which is critical when you’re Usain Bolt! Here’s a good documentary on Bolt. Some training stuff at the beginning and the 21-25ish minute marks. Looks like going through a screen, doing some t-spine rot. mobility, some glute activation, the quadruped hip extensions you talked about, some hack type squats, etc. Question the “superman” rotations at 21:54 given his APT and stress that can put on the lower back, but like you said probably not doing enough to cause a ton of damage. Cool article! From my understanding of Jamaican lifting in general… at least everything I have heard… Jamaicans do very little heavy lifting in any power based movement and they derive strength from the track coach view of strength…. heavy sleds and hills. I know Powell drags 50lb sleds or so in the pre-season. I think it is no surprise to a lot of people that the Jamaicans weightroom sessions are primitive, but at that top echelon, the “nothing extra!” principle rings pretty true. Spare the CNS for the important stuff. What I am interested in is how much extra hip flexor work they do in the weight room throughout the year. Bolt is also doing that hip flexor exercise in a mode specific to track with a high-heel recovery (stealing that for next year!). A lot of track coaches don’t do any extra hip flexor work (Pfaff and Tellez don’t from what I have heard). 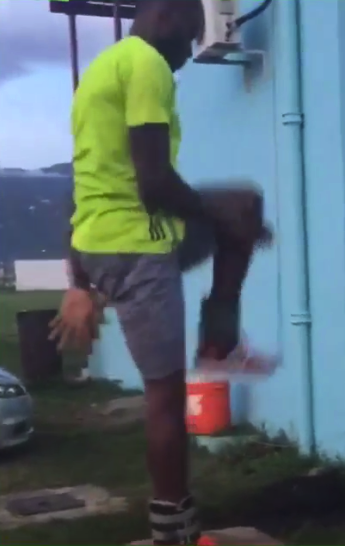 Jamaicans do a lot of “high knee runs” for 30m repeats as well… they place a high priority on hip flexors. Bret, do you think Bolt could get much more extension on that quadruped before he goes into lumbar extension? It doesn’t look like he gets his leg up to parallel. Is that how the exercise should be performed? Just curious. Good thoughts Joel! Interesting about sled work as a new study showed greater speed improvements from heavier sled work, and the mechanisms were counterintuitive. I think coaches should do some hip flexor work – what’s the drawback of throwing in a couple sets? No, I think he’s going to end-range hip extension for him – any more and he’d hyperextend. Thanks bro! 1. When you do hip flexor work, you are also doing contralateral glute work, generally. This as the off leg grounds the body, and stabilizes the pelvis. 2. Hill runs, pushes, et. al, will build up freaky strength in the glutes. It is a natural pattern that the body gets immediately, and “greases the neural groove” like perhaps no other movement. Great point about hip flexor work Derrick! If he trains like that all year round, do you think optimizing is training ( Increase in horizontal force production, training core anti movement vs movement, etc …) could make a significative difference in performance ? Hard to say – he’s Usain freakin’ Bolt! I personally would like to see him doing hip thrusts – it’s such a simple movement to learn and he’d be very strong at it, but he’d need to make sure the chest remained flat and no excessive lumbar hyperextension occurred. But then there’s the question of how much extra strength can help him at this point. When you’re at the top, it’s hard to speculate. But if you assess properly then you learn quickly what works and what doesn’t so you can stick with things that are working and drop things that aren’t. Really insightful, and well stated. 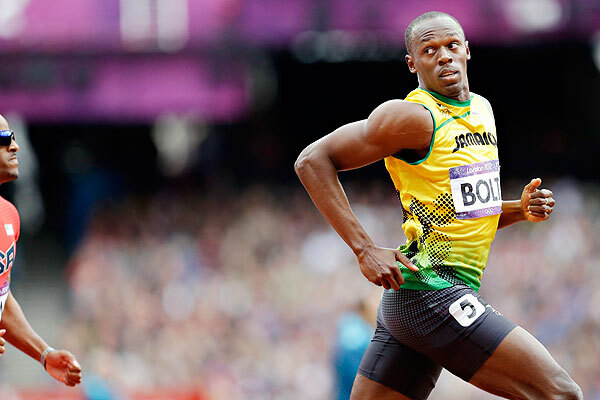 What if for training, Bolt only ran all-out 40, 60, and 100m repeats? “Train for the test” so to speak. Risk of injury too high? Drew – this wouldn’t be ideal. Sprinters need to do some runs that are shorter in distance, some that are identical in distance to their race, and some that are longer in distance. Training session volume is kept low but distances should be varied to train different qualities (acceleration, speed-endurance, etc.). Bret, I am again impressed with your ability to be an out of the box thinker and entertaining writer. The inclusion of the likes of Carlo Buzz, Verkoshanksy, and articles like this are awesome. I think there is a lot to learn from the fact that Usain trains like this and still reigns supreme. Would it work for everyone? No, because as Glen Mills and everyone else knows, he is a freak. However, as you mentioned, there are sound principles there, such as preserving CNS, keeping him healthy, prioritizing sports specific muscle function (hip flexors) and identifying specific weakness in an athlete (core), etc., that everyone, even the Godfathers of strength and conditioning who don’t train sprinters can learn from. Would his program work for everyone? No way, because Bolt is a freak. But I think it shows what is important for speed, and what components go into overall athletic excellence. 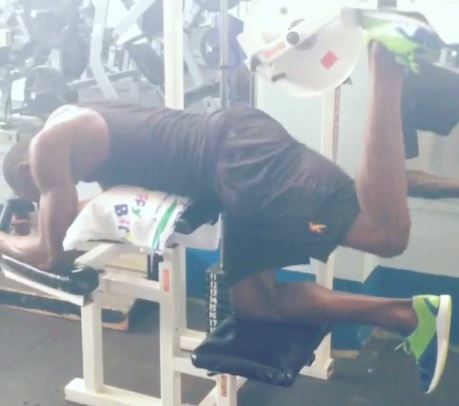 Could it be that Usain Bolt has great carry over from the weight room because he uses machines for his legs? It seems like its alot easier to cheat using free weights and I know for a fast it possible to squat alot of weight without using alot of legs. I’m thinking of Dan Riley right now. Marcus, I see your point but don’t really agree. For example, those who “cheat” at squats lean forward excessively and end up using their hip extensors to a greater degree. Many sprinters do half squats to ensure that they work their quads, and most do RDLs as well which is a sure-fire way to hit the hammies. So I think that it’s easy to hit the legs with free weights, but I do agree with you that it’s impossible to not use the leg muscles with machines (that’s what they do). Good question! Brett do you think that utilizing squats, deadlifts, and hip thrusts in a 50-70% submaximal range would work well for Usain assuming he is doing all of these lifts explosively? My last question is if you say no, is this because those types of lifts are too demanding on the CNS using those types of loads? By the way great article and I always like to see what the best in the world are doing in their profession! I don’t know…good question. There was a point in time where I felt this way. It wouldn’t be better for hypertrophy. It wouldn’t be better for strength. Sure it would be better for power but he gets that with sprints and plyos. So it depends on how the resistance training is helping him (through what mechanisms). Maybe it would, but he might be better off just doing medium-high reps with these movements with great form and a controlled tempo. Though many experts claim to have it all figured out, I don’t think that anyone does as of yet. With such combined training, it’s hard to hammer down the precise mechanisms and blend of qualities that maximize speed production. Great article Bret! I totally agree that by saving his CNS for where it really matters, the sprints, he and his coach are doing the right thing. Charlie Francis would say that the sprinting should always take priority over other, more general types of activities such as lifting. And lifting truly is general for a sprinter; especially an elite sprinter. You’ll never create the speed or power output in the gym that you will on the track. This doesn’t mean you don’t do power cleans, etc. ; but it just puts things in perspective. I don’t do a lot of O-lifts in my training as a Masters sprinter anymore and utilize med ball work and explosive KB exercises instead. Strength and a certain amount of hypertrophy is important for any speed-power athlete, but how much strength do you need? It really depends on the athlete. Guys like Ben Johnson, who has a much different somatotype (mesomorphic) than Usain (ectomorphic) was obviously an exception as he could have posted some decent numbers for a power lifter in his weight class. Again his bodytype of muscle architecture (attachments sites of tendons, leverages) were more conducive to max strength efforts than Bolt. One can also argue about Specific or “special” strength exercises (a la Verkoshansky) playing a key role in elite sporting development; but this seems to be solved by Bolt’s use of the weighted sled as you discussed. The hip flexion exercise and end range (pendulum) hip-extension exercise also seem like wise choices. The ultimate goal as you mentioned is to stay healthy mentally and physically. By letting Bolt enjoy his training a bit (power cleans, curls for the girls! ), he is setting himself up for a more balanced approach to elite fitness development for a sprinter. Exactamundo Keats!!! Preaching to the choir. I see where Bolt’s training is right for him. Why did Ben Johson have to be so much stronger ? How did these two compare ? Different strokes for different folks. Maybe Ben would have been even faster had he done less resistance training and more explosive or sprint training. Maybe Usain would be faster if he did more heavy resistance training. Maybe Ben’s anabolic regimen allowed him to get way more muscular without hampering his sprinting. Everybody is different, and research shows that some folks rely more on gains in stride length for speed gains, with others relying more on stride rate increases. Lots of factors at play. Thank you he’s one of my fave athletes I am happy to see this blog! Glad you liked it Kel! Great write up and a few takeaways that are vital. This is a common error when training athletes, too often the effort is placed on making the athlete into a strength athlete rather than optimizing performance. Second, “This is important because Usain should have a positive outlook on weight training and be committed to his training.” This is vastly underrated with many athletes, I have found making simple substitutions can make exercises much more enjoyable for athletes, improving effort and consistency. That’s all i’ve got, thanks Bret! I can declare that i am or have been one of those strength coaches who has overly emphasized strength training and hindered a few athletes as well as myself as I continually get injured with hammie strains etc. (I m a 400m sprinter) Misguided info from some top level strength coaches. Because of their training, I think sprinters can handle far less in the gym than the general client looking for aesthetic goals. With yours and others assistance I am learning at what the body can handle now, especially for sprinting. From my person exeriences, I believe the problem is that athletes aren’t strong enough in the right places. As an example, when I was 27, I could squat 485 ibs at a body weight of 190 and I couldn’t dunk. After reanalyzing technique, my i dropped the weight. Today I’m 32 and I full squat 315 at a body weight of 175. I can dunk with too hands. I just feel like athletes cheat on lifts and they’re not stressing the correct muscles for speed. No amount of speed work got me me to be more explosive. Only when I began to lift with proper form and muscle activation did improve. Marcus, what is your email, I have some questions if you dont mind? Great article. You and I have talked about some of these things several times, and the way you wrote this put a lot of things together. Your point about not letting strength training interfere with speed training (or any sports movement training) was spot-on and misunderstood by many strength coaches. Another great point was about elite athletes often understanding what their bodies need. I can’t tell you how many times “strength coach” have pooh-poohed my use of hip flexion and extension exercises, but just about every athlete seems to “get it” right away. It’s also funny to see Usain do things like use machines and perform “old school” ab exercises while some coaches claim those things are absolutely stupid. How many times have we heard inexperienced trainers say things like “If I were training Usain Bolt, he’d be even faster.” Well, this article kind of puts that to rest and I loved it. Nice job. I think the reason Bolt catches the bar in that position is because he’s using straps. Whatever he does it sure works for him! 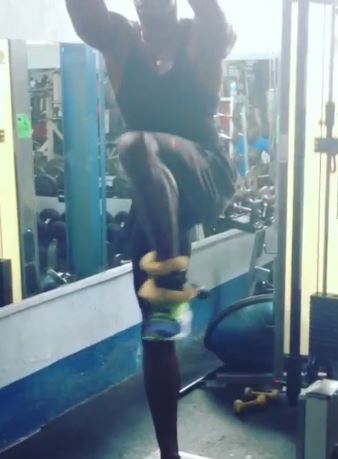 I must admit I share Usain’s thoughts on heavy squats and personally like to train the movement with goblet squats (for mobility etc) as a warm up mainly and then focus my lower body work on a rotation of high pulls/clean and presses, swings and step ups. I enjoy these exercises and they give the body a top to toe workout still. As usual amazing. Got to this late but man everyone ha some insightful stuff on this article. I think as a master’s sprinter on the come back I’m doing too much after this reading going go preserve the CNS more going foward. I think that what this article shows is the importance of taking an athletes individuality into account and that really gifted athletes can train poorly (or be trained poorly) and still excel. I do not think there is anything particularly clever behind Bolt – he’s gifted in multiple ways and he has an advantage regarding his PED use as have all West Indian sprinters. Ben Jonson was arguably as shocking and impressive as Bolt in his day and he LOVED heavy, deep squats on a regular basis, Charlie Frances being a big fan of the early Eastern Block methods. Institutional use of banned substances/access to great chemists. Despite all the various factors that sprinters rely on to perform, it is the above 3 that are consistent in ALL great sprinters since the 80’s. How can they have such differences in weight training methods,heavy vs light etc. and all of them becoming champion. Being gifted is probaly the most essential one. Luck yes, as well (also in having no-injuries). And substances are being used as well. Hey, just wonderin…first off, would you say all the top sprinters are using PEDs?? Secondly, how long would it take to find a program that’s optimal for your sport?? Is it mainly trial and error? ?